Bill • Proposed program would teach students about dangers of weapons, what to do in case of a shooting. Chris Detrick | Tribune file photo A bill advanced to the full House on Monday would limit liability of gun makers and manufacturers. They only could be sued for a death or injury in cases of "gross negligence, recklessness or intential misconduct." Scott Sommerdorf | Tribune file photo Sen. Todd Weiler, R-Woods Cross, is proposing legislation that would create a pilot program for instruction about gun safety in schools. 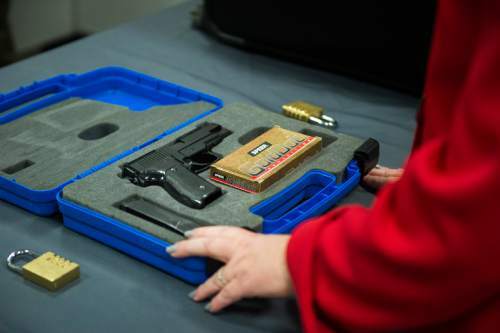 Utah students will learn what to do in case they encounter a gun, or a gunman, if a new bill becomes law. The proposal, sponsored by Woods Cross Republican Sen. Todd Weiler, calls for the creation of a pilot program to provide lessons on firearm safety and shooter scenarios for eighth-grade students. "I think it&apos;s always helpful for children and adults to think through what you would do in a situation before you encounter it," Weiler said. "Unfortunately, it is probably a necessary reality in the society we live in these days." Weiler compared the bill to instruction that students receive about drug and alcohol safety, like the Drug Abuse Resistance Education program, or D.A.R.E. The program would be optional, he said, requiring parents to sign off on their child&apos;s participation. Classes would not demonstrate how to use a gun, Weiler said, but instead would focus on teaching children to contact an adult if they come across a firearm. "There will be no guns in the classrooms," he said. "It&apos;s more, if you happen to encounter a gun, this is what you should and shouldn&apos;t do." He said the driving force behind the bill is the number of stories each year in which a child picks up a gun and accidentally shoots themselves, a parent, a sibling or a friend. Eighth grade was chosen for the pilot program because at the age students traditionally attend it, 13 and 14, children are more independent and under less supervision than younger ages, Weiler said. "Even if someone doesn&apos;t have a gun in their home," Weiler said, "odds are very likely that a neighbor or a friend&apos;s parents do." The bill also calls for instruction on attacks involving gunmen, but Weiler said that is secondary to teaching students to be cautious and responsible around firearms. "If we&apos;re going to talk about guns while we&apos;re in school, I think it would be silly not to be able to mention something about an active shooter situation," he said. Schools are currently required to develop safety plans and procedures, which typically include training students for fires, earthquakes, health emergencies and evacuations. And recent legislation has directed schools to hold regular seminars on bullying, suicide prevention, Internet safety and substance abuse. The State Office of Education coordinates some of those programs, with others held at the discretion and specifications of local school boards, according to Deputy State Superintendent Sydnee Dickson. She said she was not aware of a specific Utah school running a gun-safety program, but she said such a program is possible, if not likely, under current law. "Local districts and charters can add anything to state standards," she said. 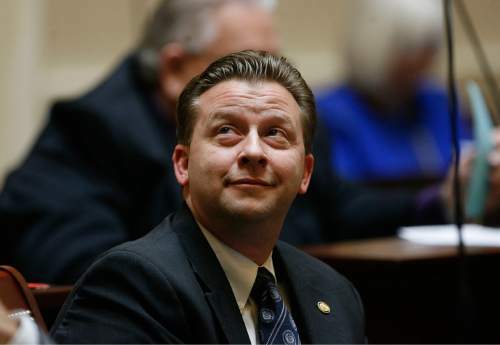 Weiler&apos;s bill would provide $75,000, administered through the Utah attorney general&apos;s office, to hire gun safety experts and provide curriculum materials for participating schools. He sponsored a similar proposal during the 2015 legislative session, but that bill failed to reach the House of Representatives after passing the Senate with a vote of 25-3. "We just ran out of time before it got up in the House," Weiler said. "I&apos;m trying to start earlier this year, and I think it will be successful." Dickson said the state school board had not yet reviewed Weiler&apos;s bill and did not have a position on the proposal. She said the funding likely would not be enough for a statewide program, but would provide an incentive for interested school districts. "That $75,000 wouldn&apos;t go very far," she said. "This is a pilot. It allows for [school districts] to opt in to the program and to try it based on their own contexts and concerns and needs."